Here’s news and views of this fortnight once again for you from the Suchitra Campus! Greeting to all our Dear Parents! We are happy about finishing the First Term of this academic year, and as we come to the end of the term, we would like you to have a glimpse of all our academic and non-academic activities. “Success is a journey, not a destination.” We are striving to be successful in all areas and we are happy to see the outcome in our students with the closure of our first Term. Qualitative improvements are happening and to ensure good quality education we are seeking parent suggestions to maintain the consistency. To improve student performance in all aspects we are training our students in all-round developmental activities. They are learning much more in school than just academics. We are sure we cannot accomplish anything without the support of our Parents and well-wishers therefore we regularly involve you dear parent in our school programmes and accept comments and compliments with the same spirit and enthusiasm. 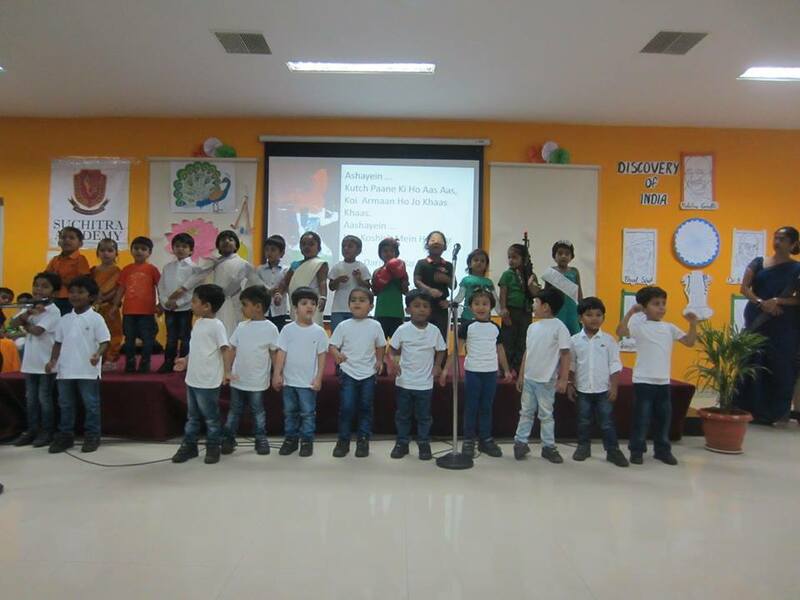 Pre-primary children performed amazingly well on Thursday 24th September for the theme-end presentation. This presentation covered the theme ‘Discovery of India’ and ‘learning through stories.’ It was astounding to watch the Sr. KG kids compere and present the whole show. The Jr. KG and Nursery kids supported the show well with their performance. It is very important that the children come to school in time. Please ensure your child arrives no later than 8.30 a.m. as the 10 minutes before assembly give your child the opportunity to familiarize him/herself, greet friends, unpack the bag and have a quick play before having to settle down to more formal activities. Every morning, during assembly children are encouraged to talk about things of their choice. Please make a big deal out of these at home too and encourage your child to speak a few lines about everyday objects around us, like- refrigerator, spoons, plates, TV, laptop….the list can be endless ! 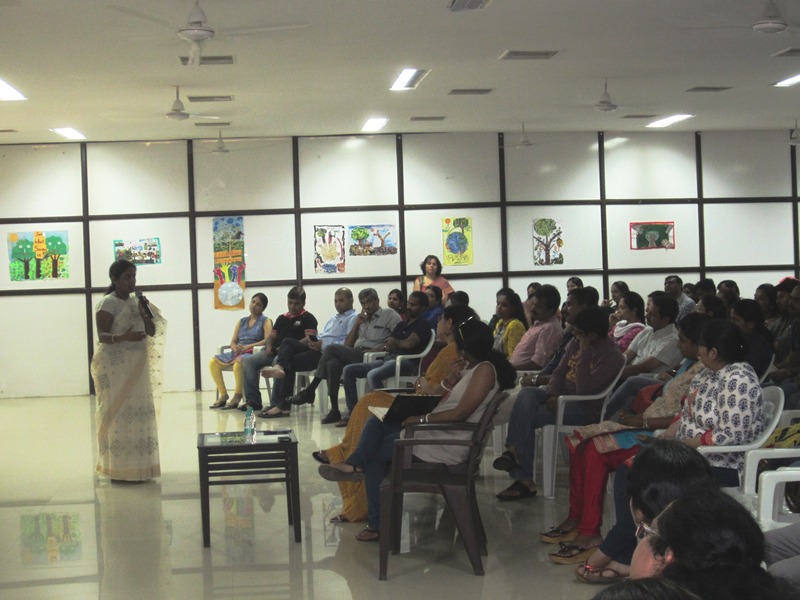 On Saturday, 19th September, a special lecture on CAUSES, IDENTIFICATION, INTERVENTION OF ADHD AND OTHER LEARNING DISABILITIES was conducted by Dr Padma Palvai, a renowned psychiatrist and child counselor. She spoke at length about the intricacies of a child’s behaviour and the various areas where a child can experience learning difficulties. She also stressed the fact that a child could be excelling in one subject but might be having difficulty in another, a fact which leaves all parents and teachers confused and at their wits end. She also explained the various ways and techniques to deal with these situations. It was a very informative session and the highlight was the eye-opening interaction with the parents wherein they asked a lot of questions and got many of their doubts cleared. 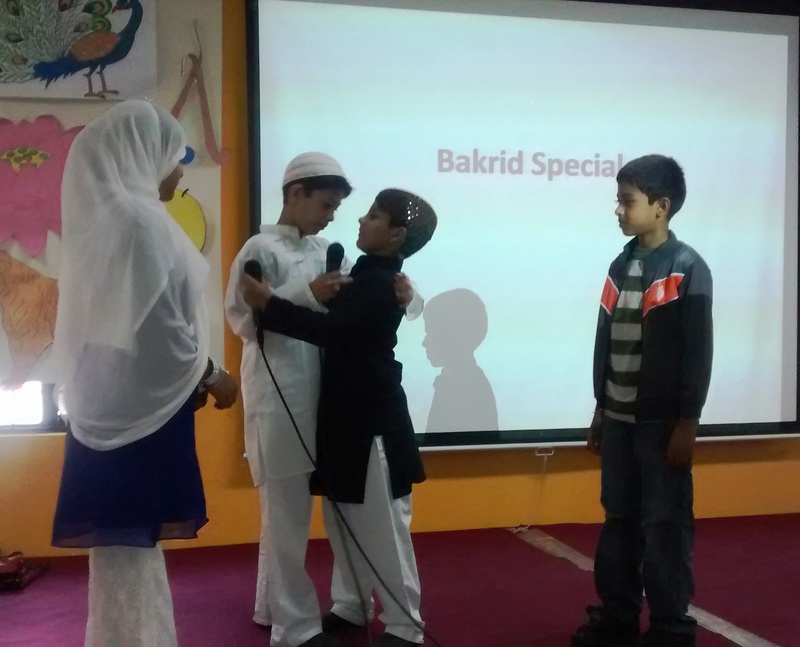 A special assembly on ‘Bakrid’ was conducted on Thursday, 24th September 2015. The students enacted a short skit which highlighted the significance of Bakrid. The students explained that it is a celebration of the spirit of sacrifice, love and brotherhood. They also focused on the various traditions and customs followed during the celebrations. An informative ppt and video which narrated the story of Bakrid was shown to the students. Grades I to VIII finished their SA 1 exam on Monday, 21st September. Grades IX and X began their SA 1 exam on 21st September. Their exams will get over on 30th September. A SCHOLASTIC BOOK FAIR is being held at school from 21st September to 26th September. A wide range of books- fiction, non-fiction, informative, encyclopedias etc are displayed. Each class was given a special slot for browsing through the entire collection of books and they selected some interesting books for themselves. This book fair was an ideal exposure to the interesting world of books and the infinite knowledge they can give. We are sure as the students start reading their newly acquired books, they would discover the joys of reading. We also had Ms. Rubina Majid from Scholastic, taking up activities like story reading, plotting, reading between the lines, novel reading and an activity around it and crossword puzzles etc which were conducted grade-wise. These sessions were thoroughly enjoyed by one and all. 2nd October – Gandhi Jayanti Holiday. Dear parents when you come on 26th to meet the teachers and review the work done by your children some of you may have a happy interaction and some of you may feel discouraged. Regardless of whether kids have fared well or not, their journey has been a great learning experience. Of this I am certain. The kind of activities we do and the experiences we create work at a deeper level and give your child an understanding of the world around. Yes, we do not give dictated answers and pre-worked upon essays. Yes, we do not make them mug up question and answers. Instead we enable the child to create on her/is own. To us that is growth and that is learning. This is tedious not only for the child but for us too but this is the only way we know and the only way they learn to learn. So please support us and cooperate and you will see real growth in your children. We start a fresh page- II Term from Monday and cheers to that. It’s that time of the fortnight once again when we bring you the latest news from the Suchitra Campus! Story telling is an art that has mental, social and educational benefits for children. It’s a great activity for learning. It makes children curious and encourages them to ask questions. On Tuesday, 1st and Wednesday, 2nd September in keeping with our ‘Learning through stories’ theme the Pre-primary children were treated to a number of wonderful storytelling performances by parents. A very big thank you to Mrs. Beena Robin, Mrs. Shalini, Mrs. Shubhra, Mr. Renil George, Mrs. Krishna Latha, Mrs. G. Swetha Reddy, Mr. Rakesh Jain, Mrs. Harsha Jain, Mrs. Fatema. Najmi, Dr. Swapna, Mrs. Janvi Dulan, Mrs. Minakshi Arya, Mrs. Varsha Kiran, Mr. Kishore Vasashali, Mrs. Komal Jain and Mrs. G. Nischala. 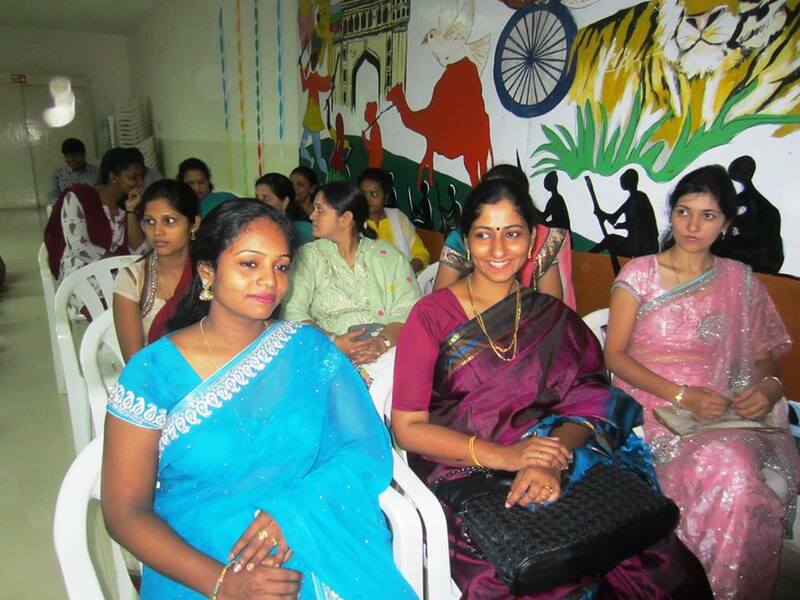 Teacher’s Day was celebrated on Thursday 3rd September in the Pre-primary block. Kids conveyed the message that they care by giving flowers, cards and tokens of appreciation to their teachers. Teachers on the other hand enlightened the children about the importance of this Day and why it is being celebrated. Pre-primary celebrated Janmashtami also on the same day. The little Krishnas and Radhas looked adorable in their traditional costumes. The entire area was transformed into a land of joy, celebrations and happiness. The Krishnas formed a pyramid and broke the pot hung with curd and flowers. Our little Radhas danced around the Krishnas. The entire event was enjoyed by all. Grandparents are grand blessing and grand wisdom in so many ways. They have patience and time when parents are often busy. They have stories to tell and interesting games to play. They are also good for treats and spoiling, which we all need from time to time. To let them know how important they are the Pre-primary celebrated Grandparents Day on Thursday 10th September. Children made cards for their Grandparents and expressed their love. They also performed a dance and sang a song expressing their love and gratitude for their Grandparents. The day ended with fun and frolic as Grandparents shared their own childhood memories with all of us. We thank all the grandparents who took the trouble to turn up in large numbers. From 21st to 24th August, the students of grades VIII, IX & X, participated in the 12TH DR EMILY EMMANUEL INTER SCHOOL BASKETBALL tournament for boys and girls conducted at St Andrew’s School. The students practiced religiously and rigorously for these matches and exhibited excellent team work and sportsman spirit. Although this was their maiden interschool participation they were befitting opponents to all the experienced teams. Sarvesh Paradkar of IXA was adjudged the best player of the match against MGM High School played during this time. On Saturday, 22nd August, 2015, seven students of grade VIII, attended the MERK MODEL PARLIAMENT at Meridian School, Kukatpally. This was the very first time that the students had attended such a programme and the purpose of this visit was to give an exposure to the students and an opportunity to experience first hand the proceedings of a mock parliament, MUN, with the aim of being able to organize such events at our school. On Tuesday, 25th August 2015 a special assembly on the topic ‘IMPORTANCE OF RAKSHABANDHAN’ was presented by the students of grade IIC. They enacted a skit to show the significance and rituals that are followed in celebrating this wonderful festival. The true spirit of ‘rakhi’ was put across vey well by the students. They also sang a song and spoke about the significance of this festival in our culture. Wednesday, 26th August 2015 saw grade VA presenting a special assembly on the topic ‘THERE’S A TIME FOR EVERYTHING.’ This presentation conveyed the fact that there is always a right time and place for everything in life. The presentation addressed the youngsters of today who are always in a hurry to try out things like driving, dating, net browsing etc. well before the permissible age. This fact was portrayed beautifully through a skit followed by a video. The presentation ended with a song. All the children spoke confidently and carried the presentation on their shoulders. 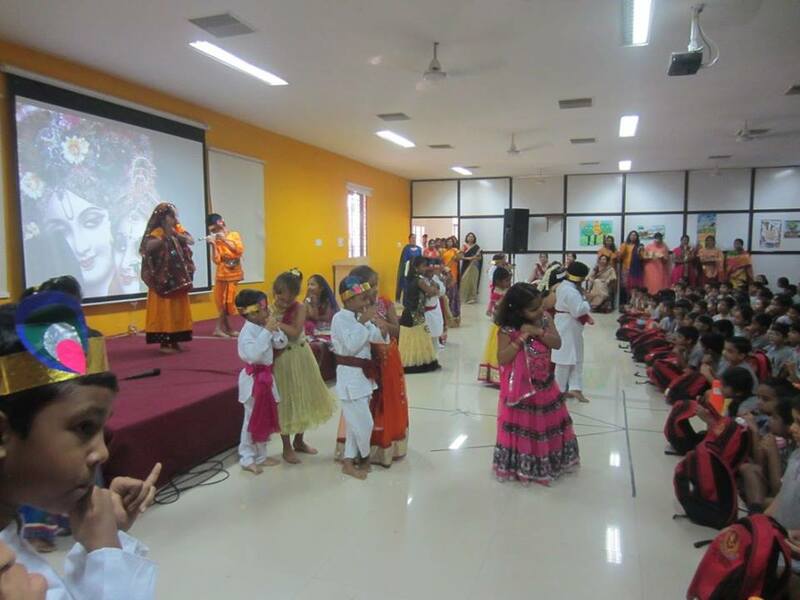 On Tuesday, 1st September, grade IIB conducted a special assembly on GANESH CHATURTHI. It was a beautiful assembly which began with a devotional shloka in praise of Lord Ganesha. The children narrated the story of Ganesha and an interesting video was shown. They also explained how Lord Ganesha came to be known as the god of wisdom and also ‘Vignaharta’. As a special activity, a grand show on JANMASTHAMI was held on Thursday, 3rd September. 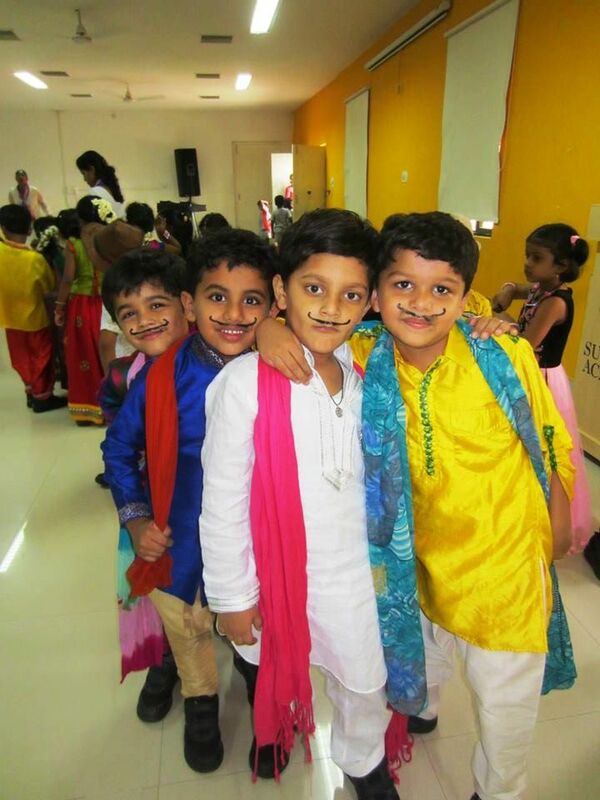 All the four sections of grade I showed excellent teamwork and portrayed the entire story of Lord Krishna through a series of skits, dance and music. The students were perfection personified and their elaborate costumes and acting skills, left the audience spellbound. Everyone enjoyed the assembly. Heartiest congratulations to the tiny tots of grade I. 3rd September was also the day of TERM I SPELL-BEE FINALE. The Spell Bee comprising of seen and unseen words was conducted for grades I to X. This is an event that all the students eagerly look forward to and their scores give them a sense of achievement. The Spell Bee toppers would be informed through a diary note. Friday, 4th September was a special day for the teachers as well as the students. It was the most awaited day, the preparations for which had been going on in a total hush hush manner. It was the celebration of TEACHER’S DAY. The morning began with the teachers entering a beautifully decorated faculty room. 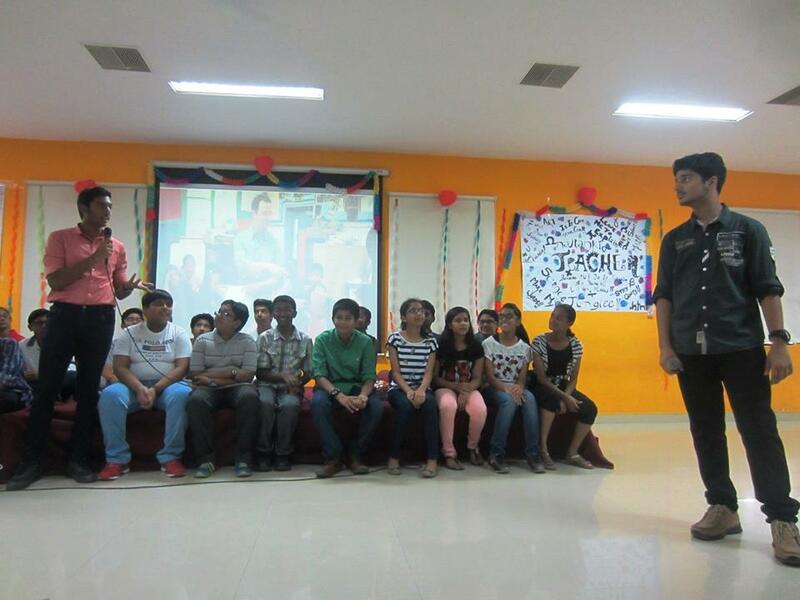 After that began the elaborate entertainment programme put up by the students of grade VIII, IX and X. The students enacted a skit, sang songs and danced to a medley of old to new foot tapping numbers. Then followed a tribute to the teachers by the students where they felicitated each and every teacher and spoke a line or two about what makes her special. In the afternoon the teachers had a special lunch and enjoyed the various games that were planned for them. It was a wonderful celebration which left lasting memories. The teachers were also given gifts of appreciation by the school. A general Medical and Dental camp was organized over two days Tuesday, 8th September and Wednesday, 9th September by Dr. Kiran A. and Dr. Madhavi K.A. 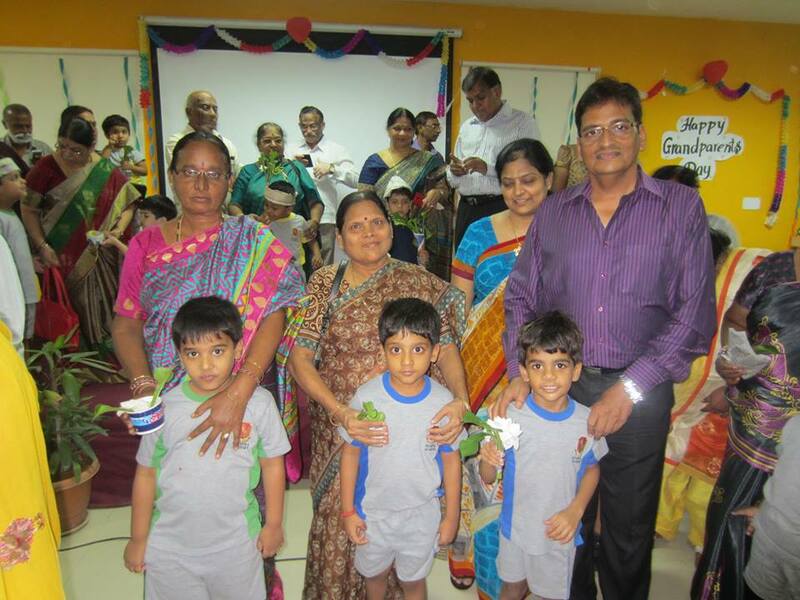 (parents of Dhruv Kumar Naidu of grade II C ) of Aaditya Hospital. All the students from grades I to X got their medical and dental check up done. The check-up reports were sent home with the child. We are extremely thankful to the doctors who spared 2 full days to make this Camp happen. 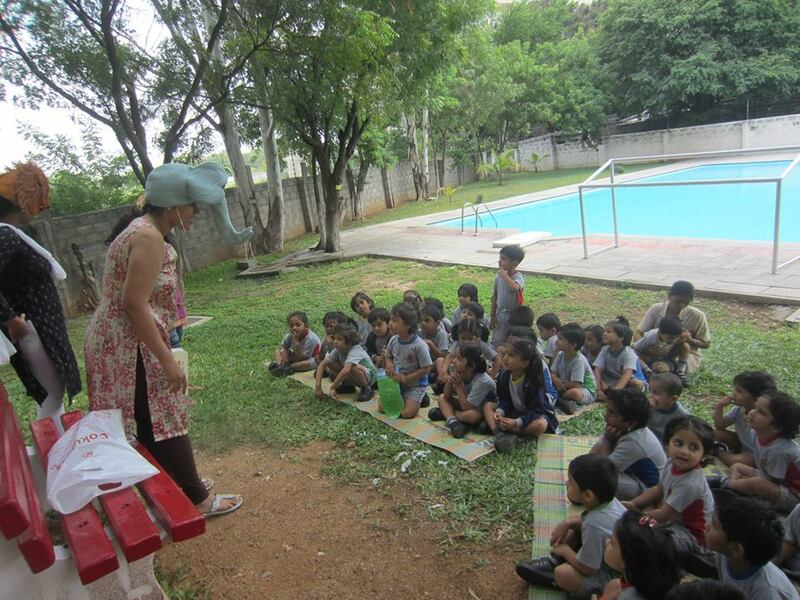 On Wednesday, 9th September grades I to II went on a field trip to the Nehru Zoo. It was a long awaited field trip and the bright and sunny day in between a rainy week doubled the fun for the children. The students were awed to see the huge tortoises and the ferocious tigers and the timid deer made them shriek with excitement. All the children enjoyed the walk under the shady tree, the train ride and relished their packed lunches in the open air. It was an exciting and a memorable outing for one and all. Same day Gr III went to NTR Gardens. This was to have knowledge of the tourist places of Hyderabad, ” MY CITY HYDERABAD “ a topic covered in Social Science. Children had good experience observing the blooming flowers, plants and enjoying the rides. Also, a visit to the Play Pen added to their fun. A ride on the train kept them excited throughout the trip wherein they saw the beautiful gardens in their semi-natural habitat. Overall, the trip was an excellent outdoor activity. Dear Parents I find it so regretful that from time to time, we are forced to charge a late fee and talk about withdrawal of the bus services, when the fee dues have not been paid much beyond the extended time. There are several reminders sent. Our smses seem to be of no consequence too, as we are often told to call and remind as “we don’t check our messages”. Please be fair. Is it possible to make calls to the large numbers of defaulters we mostly have? Some parents are extremely rude when calls are made and our staff is left feeling humiliated. I am sure there is a better way to deal with this whole business of paying your dues in time. Please do cooperate and let such situations not arrive. On the other hand I must thank most other parents who are extremely punctual and pay well in advance. We start out Term 1 SA and Tests from Monday, 14th Sept. Lessons have been thoroughly revised and children been brought up to date. Please do not be anxious, the children will do well. Please send them with proper writing –board and stationery and in time. Let’s have a peek at what we’ve been up to these two weeks. Cooking with your kids is the best way to teach principles of good nutrition and encourage healthy eating habits for life. Cooking gives preschoolers an early grounding in science, math, language, art and even reading. Getting young ones to describe what she/he sees, tastes and feels feeds their vocabulary and exposing kids to food’s myriad colours and textures provides them with a whole new creative palette. On Thursday 20th August, Kids made Tiranga sandwich, which added a new dimension to their learning. Making the sandwich not only took care of their cooking skills and taste buds, we also touched upon the colour of our national flag. 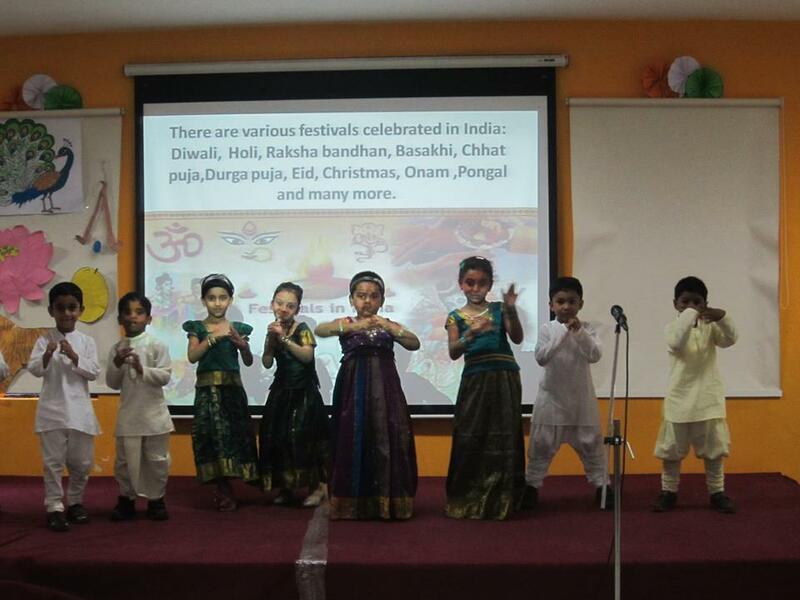 During the theme ‘Discovery of India’ children learnt about the various festivals, places of worship, national symbols, our present and past leaders, through stories, videos and PPT’s. 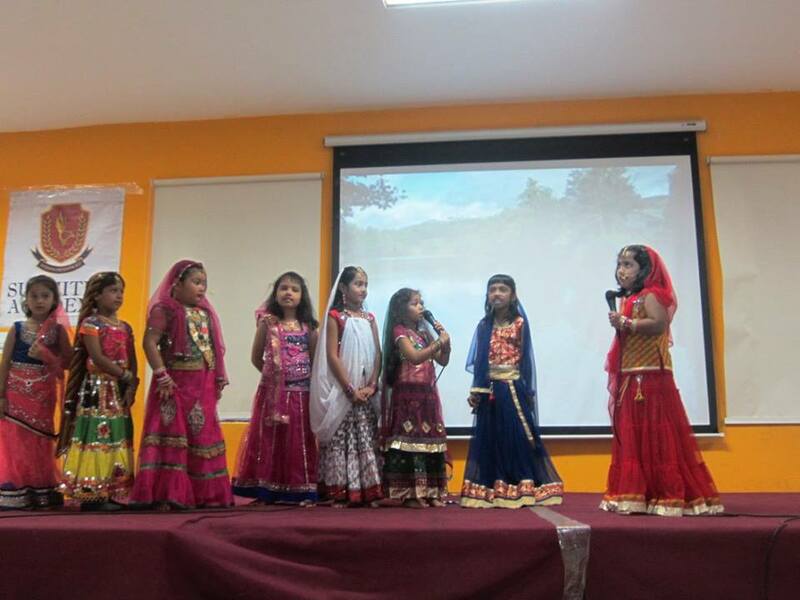 On Friday 21st August, to get the kids acquainted to rich Indian culture the Pre-primary teachers and students put up a presentation for the senior school, through PPT and dance performances from North, South, East and West. August month was full of festivals, celebration and competitions. The atmosphere was filled with feelings of brotherhood, patriotism and playfulness, as we celebrated Independence Day and Rakshabandhan with lot of zeal and enthusiasm. The festival of brotherhood was celebrated on Thursday 27th August, by making Rakhis. Children also watched a video on Rakshabandhan and understood the significance of this festival. Ask specific questions about what happens at school each day and how your kids feel about it. 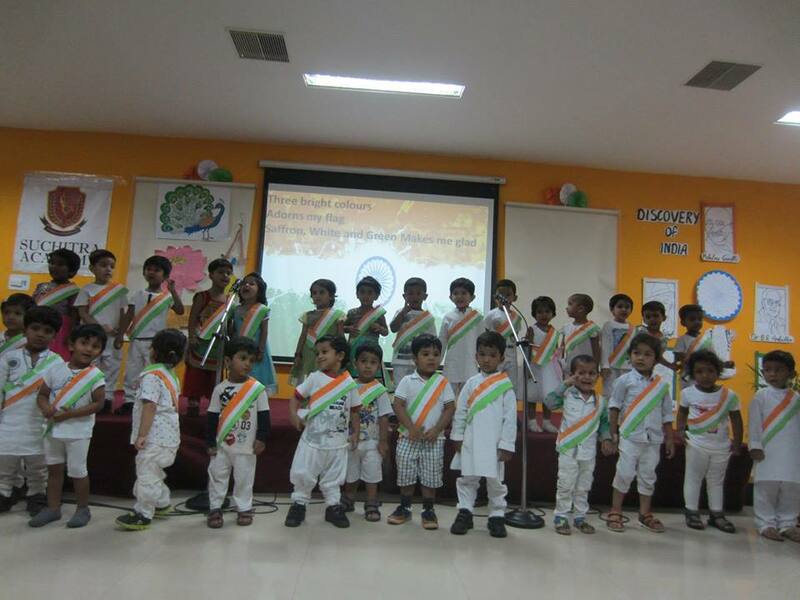 On Friday, 14th August, grade IIA presented a special assembly on the topic ‘Independence Day.’ They enacted a skit to pay tribute to the national leaders and spoke about their sacrifice in helping India, gain independence. The children came dressed as various freedom fighters such as Chandra Shekar Azad, Bhagat Singh, Mahatma Gandhi ,Jawarharlal Nehru to name a few. They also spoke about the celebrations of Independence Day and the importance of respecting the Indian Flag. They sang a song expressing their love for the country. Tuesday, 18th August 2015, yet another special assembly day! 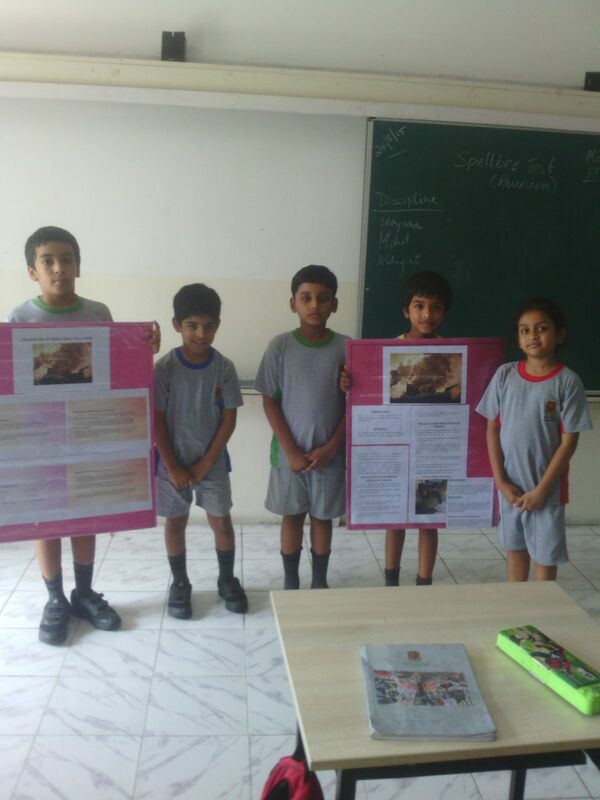 The children of grade II D presented a special assembly on the topic ‘READING MAKES A MAN’. The children dressed up like different books and depicted the world of books consisting of English, Math , History ,Science and Story Books. They spoke about the importance of reading books and also presented a skit . There was also a presentation on ‘Why we should read books?’, followed by some famous quotes on reading . The assembly ended with a pledge to be a regular book reader. The curtain was drawn with a dance to the tunes of the song ‘I love reading’. It was a beautiful assembly which highlighted this very important aspect of learning. Since we had a special assembly which stressed on the importance of learning here are 10 reasons to read aloud to your children. When you hold children and give them attention, they know you love them. 2. Reading to children will encourage them to become readers. 3. Children’s books today are so good; they’re fun for adults too. 4. Illustrations in children’s books rank with the best, giving children a lifelong feeling for good art. 5. Books are one way of passing on your values. 6. Book will enable a child’s imagination to soar. 7. Until children learn to read them, they will think you create magic. 8. Reading together helps develop a child’s attention span. 9. When you give children this gift, you create special memories that last a lifetime. 10. When you read aloud you pass on the love and joy of reading to your child thus enriching him/her for life. On Wednesday, 19th August 2015, grade VII A presented a class assembly on the topic ‘EVERY CLOUD HAS A SILVER LINING’. The presentation started with a conversational skit where a group of friends discuss the direct and indirect challenges they face in their daily life. The proverb ‘Every cloud has a silver lining’ was introduced to the audience and its meaning, origin and adaptation were explained with a power point presentation. The relevance of the proverb and its relation with our daily life were very convincingly portrayed. Two power packed videos showing legends and achievers of all times, who overcame their difficulties, were shown and the assembly ended with a motivational song sung by the children. 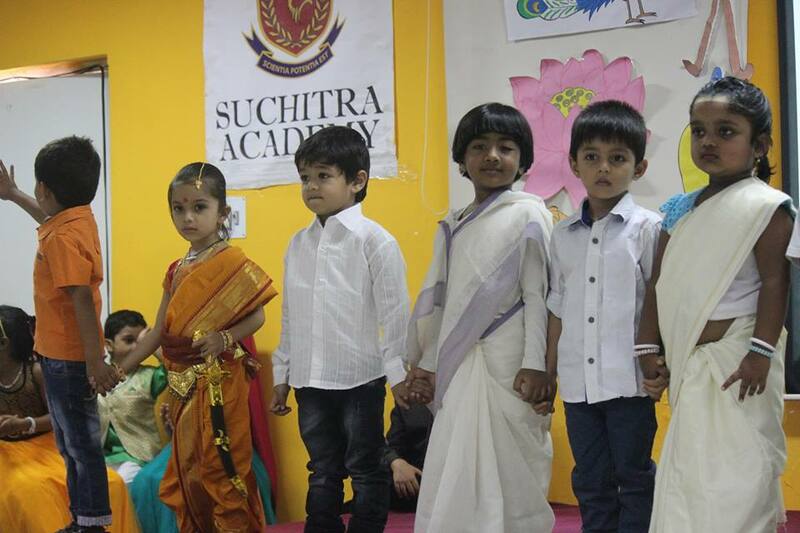 Thursday, 27th August was the day of the master chef juniors of Suchitra Academy. It was the day of COOKING WITHOUT FIRE for grades I to III. The students were very excited about the event and were preparing for it since a week. This activity aimed to highlight the importance of healthy food and healthy cooking. It was an exercise to get the tiny tots interested in food and appreciate its colour, texture and taste. The students enjoyed this activity a lot and the salads and chaats where polished off in no time. students benchmark their own performance vis-a-vis that of students internationally. For information, pl call up the office. Dear parents the portions for SA-2 and Term-end Tests have been sent to you already ( hard copy as well as soft copy). I know, the first look of it may frighten you because all put together it may seem like a whole lot to you but please do not worry! Whatever has been sent, is oft-tested, thanks to our regular and continuous evaluation system and there is nothing that the child will not be able to handle. Some of you have written to me to cut down on the portions. Please do not be anxious. The portion has been set after much thought and knowing the class appropriate abilities of the children. Also we would be revising with the kids as most of the portions are already taught. As children grow up they are able to handle and retain much more than you may think possible. I also once again request you to respect the privacy of our teachers and make phone calls only in the specific time given by the teacher. Please call only if unavoidable and crucial. Otherwise communicate through school diary or emails. We will respond to you. Please understand having personal phone numbers of the teachers is a rare privilege given by the school (and teachers) and any misuse may force us to withdraw, which we do not wish to. I wish to thank the parents who wrote in to me in response to my last news letter. They sent in interesting suggestions too which we will gradually incorporate. This letter has PARENTING TIPS ON READING WITH YOUR CHILD, as per a parent’s suggestion.